***UPDATE MARCH 2019*** Stay and play packages SOLD OUT! See bottom of this page for ticket only details for NRL and Wagga Wagga Gold Cup. Make the first weekend in May 2019 a Green and Gold celebration in Wagga Wagga. It all kicks off with the city's premier social event of the year, the running of the prestigious Wagga Wagga Gold Cup on Friday 3 May, 2019. Then on Saturday 4 May, 2019 the green machine NRL Canberra Raiders take on the Penrith Panthers in a premiership fixture match hosted at Wagga Wagga's McDonald's Park. Visit Wagga don't wan't you to miss a second of the action over the jammed packed weekend. Which is why we have partnered with a number of businesses to deliver you exclusive Green + Gold Wagga Wagga stay and play packages. Don't have time to look and book - let us do it for you! There's something for all budgets and styles. 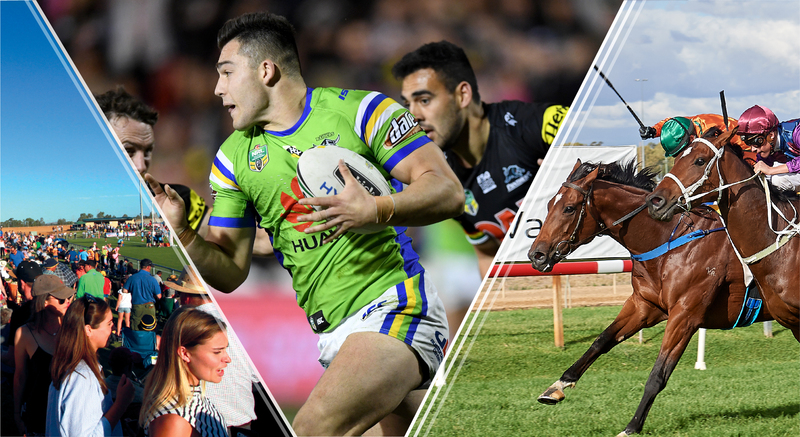 All packages are two-night minimum stays and include entry to the Wagga Wagga Gold Cup and Canberra Raiders v Penrith Panthers match. As well as savings, packages also include exclusive extras and experiences. Green + Gold Wagga Wagga stay and play packages are booked through the friendly and helpful Helloworld Wagga Wagga team. See below for more and start planning your ultimate Green + Gold weekend in Wagga Wagga. For the number 1 sporting fan or those wanting to experience the absolute best of Wagga Wagga for the weekend. Choice of Golden View or Members Reserve admission* to Wagga Wagga Gold Cup at the Murrumbidgee Turf Club on Friday 3 May, 2019. *Different prices apply. Golden View ticket includes three-course meal and beverages plus a meet and greet with Canberra Raiders player. Prices from $700 - $1000 based on two adults. Flexible and value for money - the perfect combination. Tackle the weekend head on in simple but cosy cabin-style accommodation and enjoy general admission to the races and rugby league. Just wanting tickets for the Green + Gold Wagga Wagga weekend? Here's where you can secure your's today. *In-person ticket sales also available at Wagga Wagga Visitor Information Centre or Oasis Regional Aquatic Centre. Terms and conditions for packages provided upon booking through Helloworld Wagga Wagga.